Princes s Sophia Duleep Singh was one of the leading suffragettes in the Women’s Social and Political Union and the Women’s Tax Resistance League. She was also elected the President of the Suffragette Fellowship after Emmeline Pankhurst’s death in 1928. Sophia was the daughter of Maharaja Duleep Singh who was deposed in India and sent to England when he was 15 years old. He became friends with Queen Victoria, who became Sophia’s godmother and granted her an apartment in Hampton Court. As a member of the WSPU, Sophia campaigned for women’s suffrage. On the 18th November 1910, she led a march with Emmeline Pankhurst to Parliament, to protest against the rejection of the Conciliation Bill which would have extended the vote to wealthy property-owning women. It became known as ‘Black Friday’ after there were clashes between police and protesters, with many women being assaulted. Sophia Duleep Singh was mostly known for her work with the Women’s Tax Resistance League which demanded no taxation without representation. She believed that women should not have to pay taxes if they did not have the right to vote, as they had no say in what the taxes were spent on. She was fined and sent to court twice for not paying licence fees for dogs, servants and a carriage. Refusing to pay the fines or the court fees, she had some of her belongings seized by bailiffs; however these items were bought by suffragettes at auction and given back to her. Whilst the WSPU’s activities were suspended in World War I, Sophia worked as a nurse for Indian soldiers and organised events to raise money for wounded soldiers. Her visits to India after the war created a surge in campaigning for women’s suffrage internationally. 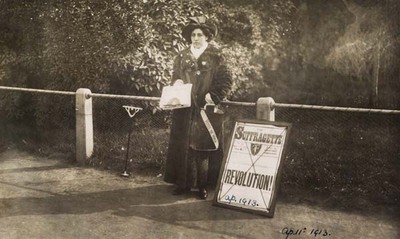 People’s History Museum has lots of suffragette items on display, including the famous photograph of Princess Sophia Duleep Singh selling copies of The Suffragette outside her Hampton Court Palace home in 1913. This entry was posted in People's History Museum and tagged Black Radicals, Suffragettes. Bookmark the permalink.